Our ladies came an excellent 4th out of 23 teams at the final of BOP teams event held at Thames on 7 May. Well done to Debbie Cotter, Rosemary McNicol, Christine Alley and Colleen Matthews(absent from photo). 28 teams played at Waihi, and with only one heavy shower was lots of fun. The course was in excellent condition with fast greens! Paeroa's team called "Joa Joa"( Korean for Good Stuff or Ka Pai) was Chris Alley, Frances Nicol, Soon Park and Rachel Yoo. We came a creditable 11th and managed to snaffle the last prize! Topped it off with a visit to the Waikino Pub on the way home. So nice to be out playing golf!! Jill Grice, Lyn Pullan and Frances Nicol represented Paeroa at Whakatane. With torrential rain for the drive down and the weather experts predicting 98% chance of rain for the Monday we were all geared up to face the elements!! But as you see, it was a beautiful sunny day in the Bay. Our golf didn't shine as much tho -placed 11th. Otumoetai won it for the 2nd year in a row with 100 stableford points. ​Lovely course and lovely company. Jill even learnt a new card game!! are our very own COLLEEN MATTHEWS & SANDY TOAL. Fantastic!! Good luck for the national results. OCT UPDATE......AND THEY DID WIN THAT TOO. CONGRATULATIONS!! 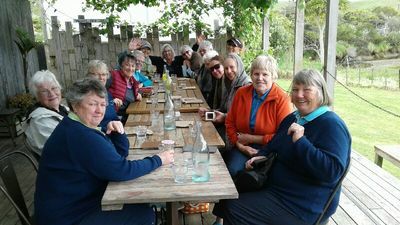 16 of our ladies headed west to the black sands and surf of Raglan. 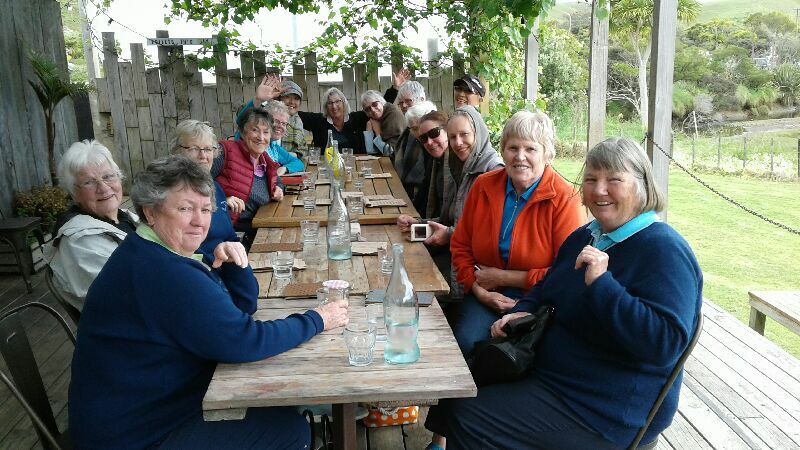 Played 9 holes of golf at Te Kowhai and Raglan with lots of laughter, food, shopping, and drinkies too. Had dinner at the historic Raglan Hotel where Elaine showed us her waitering skills, Chris Alley was the grand quiz master and Debbie was champion joke teller-not bank teller!! And after a very vivacious game of 5 Crowns, Margaret couldn't tell her left from right and ended up trying to get into the wrong bed:) ... OOPs! what goes on tour is meant to stay on tour :) All good fun-where to next year gals?